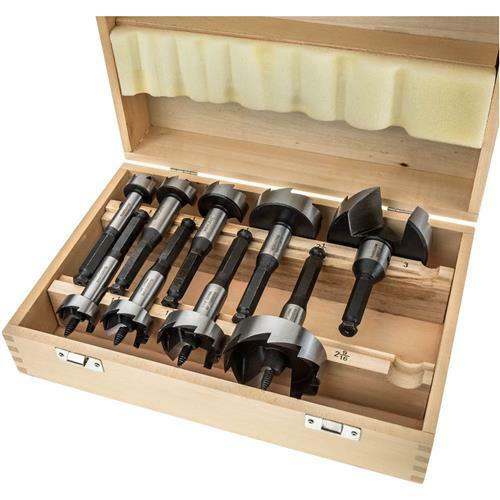 Forstner Bit 9 pc. 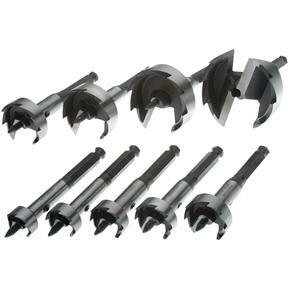 Set 1" To 3"
Grizzly H5982 - Forstner Bit 9 pc. 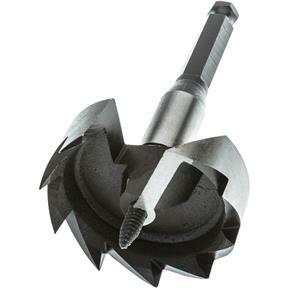 Set 1" To 3"
These Multi spur design Forstner Bits feature screw tips that pull each bit into the work piece, 1/2" shanks and black oxide steel finish. Tapered screw tips are adjustable for variable bite. Hexagonal shanks won't slip. Includes: 1", 1-1/8", 1-1/4", 1-3/8", 1-1/2", 1-3/4", 2-1/8", 2-9/16" and 3" diameter bits. Set comes in a fitted wooden case. As always Grizzly provides great service, excellent products, and fair pricing. I have only used one so far, it went through maple like butter. I have quite a few Forstners from Colt, and Bormax Famag where I pay more for one bit than for this whole box. If I can get several good hole from each, it will be well worth the money. I am very pleased with the quality of this product for the price. It was delivered on time and they preform very well. Loved the way they are packaged. Razor sharp bits and an excellent price. What's not to like? Excellent quality and storage container. A cut above the rest. Highly recommended. I bought this for my hubby for Christmas and he uses it often. He's ver happy with it. These are very good bits but the screw tip is a dangerous idea. The first time I used one the screw tip grabbed the stock and spun it out of control. It makes the feed rate way too fast. My remedy was to chuck the bits, run the drill press at a very slow speed and use a metal file to slowly cut the threads down to a smooth point. Cutting slowly reduces the chance of overheating the tip and losing the temper. Other than the tip these are a very good set of bits and at a very reasonable price.